As the 31st of October approaches, youngsters across the land add finishing touches to costumes as parents prepare to plunge the house in to darkness to pretend they are not at home. However, for the young at heart, getting into the ghoulish spirit of Halloween doesn’t need to be expensive. Even if it is just to pop a smile on your child’s face, the five spooky ideas below are simple, and won’t break the bank. Turning the front of your home into Dracula’s lair simply requires black card, sticky tac, and scissors. For parents who want a Halloween free October, pass the task to your little ghouls - just keep an eye on them with the scissors. To create a swarm of spooky bats, simply fold a piece of black card in half, and draw the outline of half a bat along the seam. Children can then slowly cut along the line and unfold the crease to reveal a giant bat. 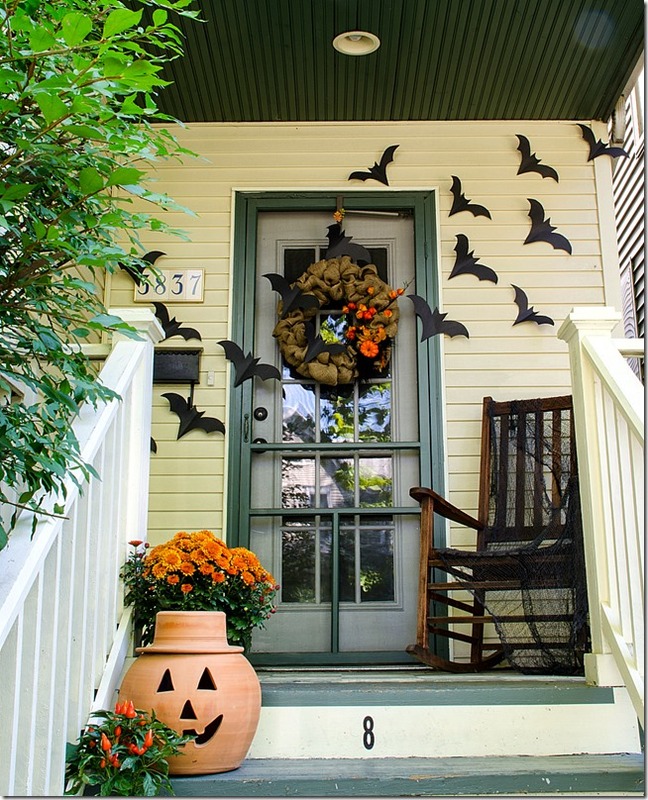 Simply attach the bats to your front door using removable sticky tac and add a couple of carved pumpkins to out-do the neighbours. We have all been there, a last minute Halloween costume panic as Mum and Dad frantically throw a white sheet across you and cut out a couple of eye holes. 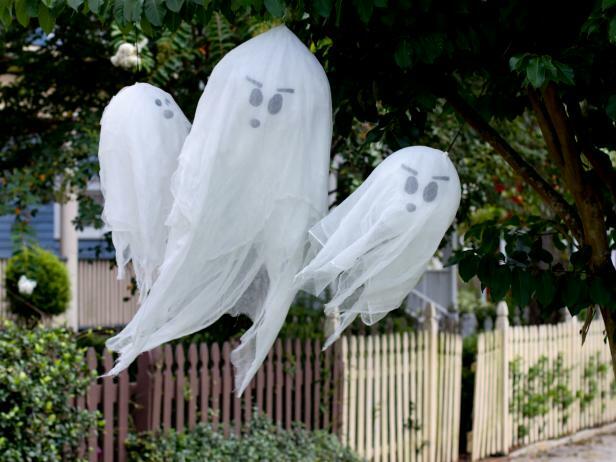 Adopting this quick and easy technique to create some eerie ghosts to hang from your front door can have a great effect. Simply get your hands on some white balloons, thin white material, string, and black tape. Help your ghost take shape by blowing up two or three balloons to various sizes and attaching a length of string to the end you have tied. Next, lay out a generous square of white material (ensuring it will drape beyond your balloon) and safely make a hole in the centre. Pass the string you attached to your balloon through the hole you created. Feast your eyes on your ghost door hanging! To give your ghost some personality, cut facial features out of black tape and stick to the material covering the balloon. Let’s turn up the scare-factor with these monstrous door decorations. These can take a little longer than our previous ideas, but what a statement they make! Monster doors are a sure way to scare trick or treaters and are a great task to complete with all the family. Rummage around the house and collect paper plates, bits of card, and any odds and ends to make your monster extra frightening. Before setting to work, does your door have any distinguishing features you can use already? Letterboxes adorned with sharp teeth make excellent mouths, and door knockers can be adapted into bulbous noses. Encourage little ones to draw out designs before you begin and then arm yourself with plenty of sticky tac and patience! Just like the Christmas wreaths that adorn front doors in December, Halloween has its own unnerving alternative. 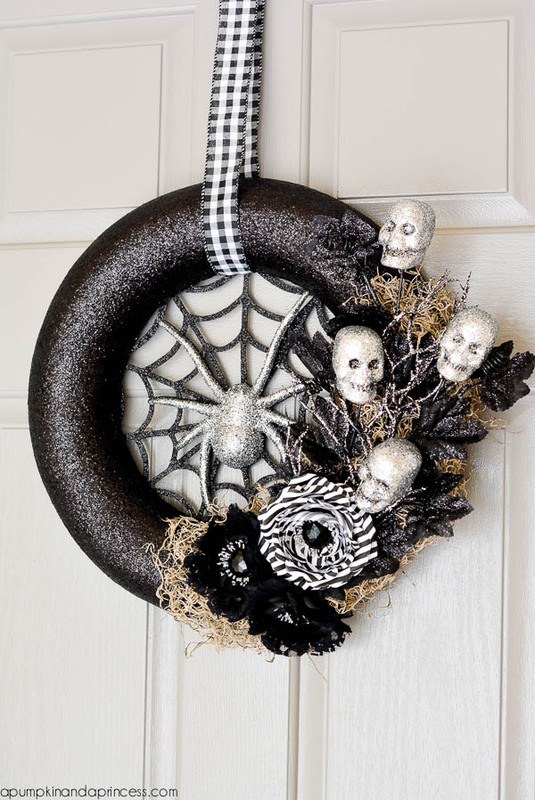 These DIY wreaths can look expensive but hunt around the garage for last year’s Halloween decorations, or pay a visit to your local 99p store. You could even give a neglected Christmas wreath a new lease of life by spraying it black and adorning it with all the spooky trinkets you have collected. Go to town with your wreath, but keep an eye on children if you are using strong glue or spray paints; we don’t need Harry going to school with a spider stuck to his hand. No doubt the creature that plagues the nightmares of many is the spider. Make the most of their frightening reputation this Halloween by turning your front door in to a spider’s nest, complete with hatchlings that will make visitor’s skin crawl. Again, the 99p store will be due a visit with this idea; stock up on black string and the obligatory Halloween webbing. If you cannot find any affordable spiders, cut some out of black card like the bats created for Dracula’s lair. To heighten the horror, add some fangs, black furry material, and black pipe cleaner legs to your DIY spiders.